Courage is manifest in so many different ways. If we are willing to look around we can see honorable examples which can lift us in the observation to a higher place. Over the past 18 months or so it was my honour to have Doug Luckwell as a friend – I’ve known Doug for over 24 years – but the past 18 months or so Doug became a teacher and example in a different way as he and his family lived through the diagnosis and experience of what is commonly referred to as Lou Gehrig’s disease. Doug and his family determined they would ride this out at home, no hospital stays, and with the help of friends and family they’d make the best of a tough situation. As a result several of us had the opportunity to help Doug with his exercises and visit once a week for about an hour – Mitch Albom wrote of a similar experience in “Tuesdays with Morrie” (I recommend the book). As we worked through the exercises Doug would do the counting and the talking, we watched the Obama/Clinton and Obama/McCain debates together, discussed politics and even though Doug had never played football he always asked about my teams, players and how the games and practices had gone. As the illness took over his body his fingers would curl up, we discovered that using a bantam sized football he could comfortably keep his hands open and his fingers comfortably positioned on the laces – he wasn’t able to throw but he enjoyed being part of the team. I shared some of Doug’s story and thoughts with the Football Alberta team in Hawaii and with the Warriors and Bronco’s. We are all reminded that what every day we have in life is a gift and we should us it wisely. President John F. Kennedy wrote, “The stories of past courage can offer hope, they can provide inspiration. But they cannot supply courage itself. For this each man must look into his own soul.” It was a blessing to me personally to witness the tremendous courage Doug displayed as he took on ALS, he knew the outcome was inevitable but laughed right up to the last day I saw him when once again – like always that shoulder of his would pop – and I’d wince – he thought that was so funny. I know that for the rest of my life I can draw on his example, as Kennedy said it provides me with a source of inspiration – I can only hope in examining my own life and soul it will provide the seed of courage I can develop in turn as I move forward each day. Thank-you Doug, I know you are in a very good place as in the twinkling of an eye your family here bid goodbye, and your family there said hello. 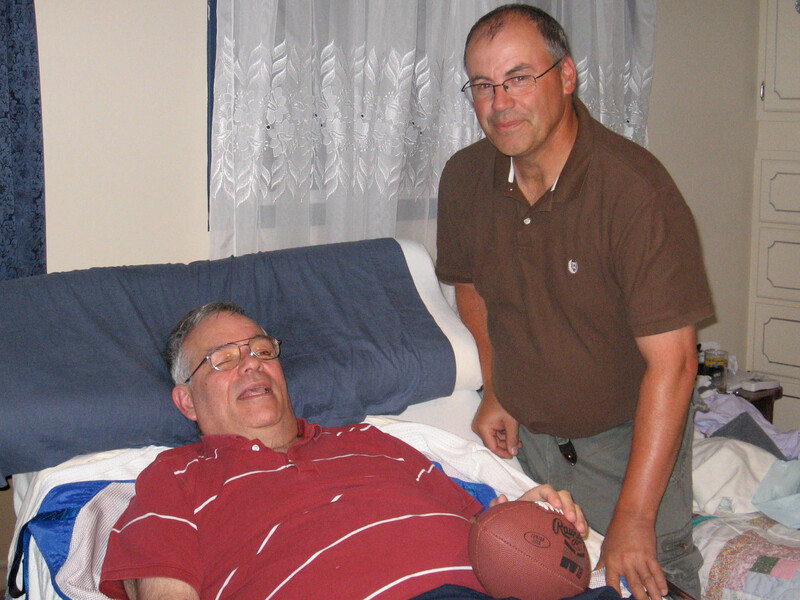 On January 2, 2009 Doug passed away in his sleep having shared with a number of his friends and most certainly his family an example of courage as he took on ALS, more commonly known as Lou Gehrig’s disease. Time passes….will I? will you?